> BANKING WITH THE INFORMATIONS BELOW. > NAME: Mr Donald White. Thank you very much for reverting back to me in due time. I write in response to your E-mail. Although i am worried,as i do not know the main reason why youare requested detailed information about the transaction.But not to worry, all protocols has been observed and i must try to satisfy your personal records for the transaction. 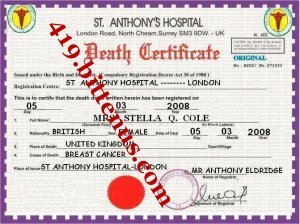 Attached below is a Death Certificate issued by ST ANTHONY'S HOSPITAL (The hospital my client passed away) The contact address is stated at the top of the certificate. I urge you to proceed further with the transaction as we are working on time factor.